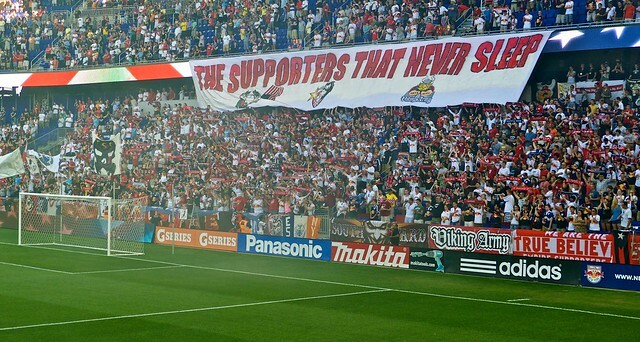 Good morning, RBNY faithful and faithless! With temperatures expected to reach triple digits around the NYC area today, and with tomorrow's clash with FC Dallas looming, let's take a look at the news. The big news this week is not from the team itself but instead from the supporters. Word coming out of the South Ward is that a unified protest is planned for tomorrow's match. The ESC has posted the formal notice of protest this morning, focused on the mistreatment of the USOC game in Chicago. Tim Hall, Ben Schneider, and our very own Matt "Who Shot Sam" Conroy have all weighed in on what may transpire Saturday night. Pressure in the media is mounting on Hans Backe; Michael Lewis asks ""Has coach Hans Backe lost the team?" in his latest column. Despite lingering concerns about attendance this season, the upcoming home match against the LA Galaxy is sold out over a month before the match. As part of All Star Week festivites, the Red Bulls will be hosting a Legends Game at 8PM on Monday night. A side that includes area legends like Tony Meola, Tab Ramos, Clint Mathis, Mike Petke, and Shep Messing will take on a group from area high schools at the Harrison Soccer Courts. Speaking of All Star Week, the league has made available a calendar of events that will be going on throughout the week. Not listed are two parties at Legends NYC: the South Ward DJ Party Sunday night (featuring DJ Jan Gunnar Solli, and guest bartenders John Rooney and Stephen Keel) and a Soccer By Ives bash on Monday night. Tim Ream and Jan Gunnar Solli recently joined MSG's Tina Cervasio to help explain a bit more of the game to RBNY's female fans. Bruce Arena has indicated that LA's mid-season friendlies aren't "that important" to him or the team. It remains to be seen if the league will fine him for criticizing the league's cash grab. Myra Kraft, the wife of New England Revolution owner Robert Kraft, died Wednesday morning after losing a battle to cancer. Lastly, former RBNY and current USMNT striker Jozy Altidore will be suiting up for Dutch side AZ Alkmaar this coming season. That's all for now. We'll be back later with previews, predictions, and prognostications about this weekend's massive tilt with FC Dallas.